A sign along a busy roadway with a blunt message directed at San Jose's mayor was getting a lot of attention Monday, especially on social media. Someone put up a banner on a soundwall along Almaden Expressway in South San Jose that essentially points blame at Mayor Sam Liccardo in the Feb. 28 homicide of Bambi Larson, who was killed in her own home by an undocumented immigrant with a long criminal history. 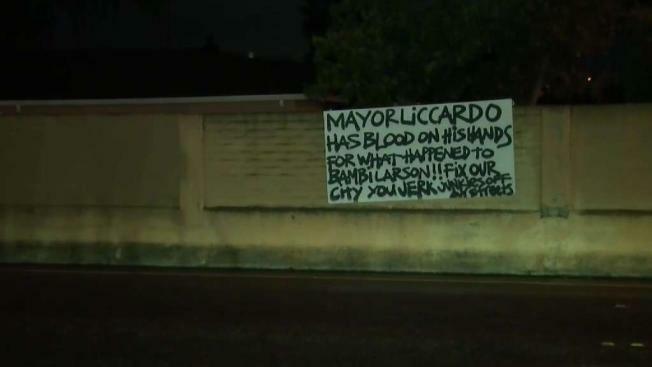 The banner says "Mayor Liccardo has blood on his hands for what happened to Bambi Larson." City leaders say they’re not sure what the author is referring to, but the mayor took the issue head on. 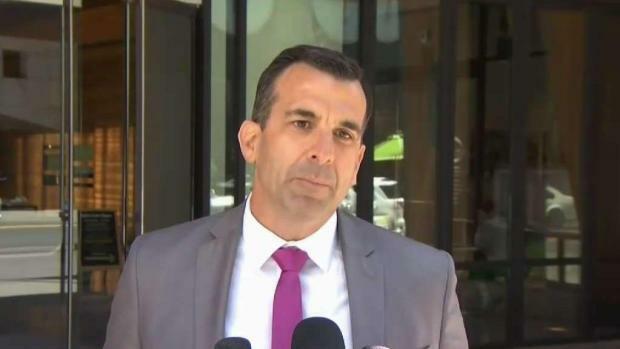 "I take my mandate very seriously, which is to make San Jose safer every single day," Liccardo said. "The most sensible response is to work harder and do more, to be smarter about how we can make San Jose safer." A sign along a busy roadway with a blunt message directed at San Jose's mayor was getting a lot of attention Monday, especially on social media. Damian Trujillo reports. The mayor said one murder is one too many in his city, and he will meet with the local community again to answer any questions. Police arrested Carlos Eduardo Arevalo Carranza in Larson's slaying. Federal immigration officials have said Santa Clara County’s sanctuary policy kept Carranza from being deported years ago. The sign, which also added the phrase "junkies off our streets," certainly was sparking conversations. "I think everyone has their own opinion," resident Keith Fields said. "But I believe he’s a good guy, so why?" On Monday, San Jose police Chief Eddie Garcia came to the mayor’s defense and reiterated his stance on the immigration issue. "I was shocked to see it, quite frankly," Garcia said. "He is not the individual whose ire they should be on. We are in full support of immigrants coming into San Jose. What we’re not in support of is the shielding of convicted felons who cause harm to our communities, regardless of immigration status." No one knows who put up the sign or what specifically the author is referring to. Merchants across the street say they noticed it Monday. The DA's office is not ruling out the death penalty in the Larson murder case.